Background: With the evolution of bonded restorations, visible light-curing units became inseparable from the practice of dentistry. This study was designed to evaluate light intensity output of light-emitting diode (LED) units used in private clinics in Riyadh, Saudi Arabia, and to investigate dentists' knowledge and attitude regarding the usage of light-curing units. Methodology: Two hundred randomly selected LED units' light intensity output was evaluated using Demetron® LED Radiometer-Kerr among evenly distributed private clinics in Riyadh, Saudi Arabia. Three measurements of 20 s were taken, and average values were obtained. Furthermore, Output intensity measurements were subcategorized into three groups; <400 mW/cm2 – inadequate intensity, 400–850 – marginal intensity, and more than 850 – adequate intensity. In addition, 100 questionnaires of ten close-ended questions, investigating demographics, knowledge, and attitude toward visible light communication (VLC) units, were filled by the same private clinics' dentists and data were collected and analyzed by SPSS. The investigation was started after official processing and agreement achieved between the investigators and the private clinics' administrators to get their full cooperation. Results: Majority of dentists (78%) reported that they do not measure the light intensity output and 9% of the measured light intensity output of LED units was found of inadequate intensity, 40.5% of marginal intensity, and 50.5% of adequate intensity. Moreover, only 31% knew the minimum accepted wavelength of VLC units. Conclusion: Dentists among private clinics express poor knowledge, maintenance, and attitude toward VLC units. Educational programs are advisable, and routinely monitoring of VLC units is recommended. Martin 1998 surveyed the efficiency of 214 VLC units in dental practices across Australia. Over one-half of the surveyed light-curing units were not functioning efficiently, and a negative correlation was found between the age of the unit and the recorded intensity. Tüloğlu et al. 2016 investigated 448 dental clinicians' knowledge and attitude regarding up-to-date LCUs and dental materials science in northern Turkey with a questionnaire which was sent by e-mail. The results showed poor clinicians' knowledge and educational programs are needed. Al Shaafi et al., 2011, evaluated 210 VLC units' (120 were QTH and 90 were LED) light output intensity with a digital spectrometer among eight governmental institutions in Riyadh, Saudi Arabia. The measured light output intensity was found unsatisfactory by 65% for QTH devices and 15.6% for LED devices and routinely monitoring of light-curing devices using a light meter is advisable. This study was designed to investigate dentist knowledge and attitude regarding the use of light-curing units and evaluate the light intensity output of LED-curing devices used in private clinics in Riyadh, Saudi Arabia which is unlike previous studies. A total of 200 VLC units' light intensity output was evaluated using Demetron® LED Radiometer-Kerr among private clinics in Riyadh, Saudi Arabia. The investigation was started after official processing and agreement achieved between the investigators and the private clinics' administrators to get their full cooperation. For the inclusion criteria, LED VLC units were only investigated in this study due to its dominance of use among Riyadh private offices; on the other hand, QTH, plasma arc, and laser VLC units were excluded from the sample population. Before the start of the study, a pilot study was conducted to standardize the methodology and to train all four investigators to collect data by cooperation. The institution identity and three separate measurements of 20 s were reported on a standardized form and average values were obtained. Furthermore, the output intensity measurements were subcategorized into three groups; <400 mW/cm2, 400–850 mW/cm2, and >850 mW/cm2 and labeled as inadequate intensity, marginal intensity, and adequate intensity respectively. In addition to that, hundred questionnaires investigating the demographic characteristics, knowledge, and attitude toward VLC units were answered by the same private clinics' dentists, and data were collected and analyzed by Statistical Package for the Social Sciences, version 24 (SPSS Inc., Chicago, IL, USA) to produce descriptive and cross-tabulation statistics. Light intensity output of 200 LED units was evaluated from sixty private clinics evenly distributed among Riyadh city using Demetron® LED Radiometer–Kerr, and data were collected and analyzed by Statistical Package for the Social Sciences, version 24 (SPSS Inc., Chicago, IL, USA) to produce descriptive and cross-tabulation statistics using Chi-square test, and statistical significance was set up at P < 0.05. Light intensity readings ranged from 50 to 1800 mW/cm2, with a mean value of 862.3 mW/cm2. Furthermore, 18 units (9.0%) delivered inadequate intensity (<400 mW/cm2), 81 units (40.5%) delivered marginal intensity (400–850 mW/cm2), and 101 units (50.5%) delivered adequate intensity (more than 850 mW/cm2). In addition, 41 (41%) dentists were female and 59 (59%) were males. Fourteen of dentists (14%) were Saudi and 86 (86%) were nonSaudi, and the majority of dentists were general practitioners (75%), specialists were of 23%, and consultants were of 2% only. The majority of dentists (78 [78%]) reported that they do not measure the light intensity output of their LED units. 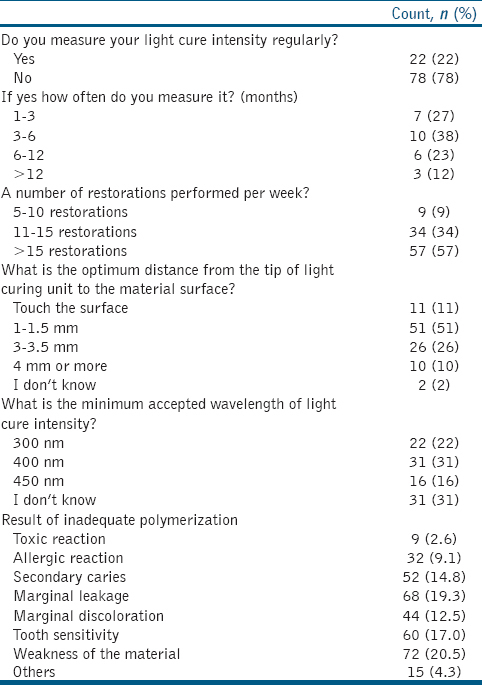 Moreover, dentists among private clinics express poor knowledge, and most of them (69%) did not know the minimum accepted wavelength of light-curing unit [Table 1]. Regardless of dentists' profession, dentists show poor maintenance and attitude toward VLC units (P < 0.05). In the current study, the mean value of measured LED units (862.3 mW/cm2) was found higher in comparison to the previous study conducted among Riyadh city governmental health institutions of 598 mW/cm2 mean value. The reason for such a difference in values seemed that private setups had superior quality of care and maintenance. Summary of mean values of LED light intensity output investigated in previous studies in different locations among private clinics is shown in [Table 2]. The study revealed that 9.0% of measured LED units were of inadequate intensity (<400 mW/cm2) and must be disposed because that 400 mW/cm2 is the minimum accepted intensity needed to sufficiently polymerize 2 mm increments of resin composite. Moreover, 40.5% were of marginal intensity (400–850 mW/cm2) which requires doubling curing time to perform sufficient polymerization. Furthermore, half the measured LED units (50.5%) were of adequate intensity (>850 mW/cm2) regardless that most of dentists do not routinely measure and monitor LED units which can be justified by the fact that LED units were actually designed by the manufacturer to maintain consistent performance over time. Nevertheless, Majority of dentists expresses poor knowledge and attitude toward the maintenance of VLC units. These results agree with previous studies which concluded that clinicians have poor knowledge and educational programs are needed. Unfortunately and regardless dentists profession, dentists in private setups seemed to lack sufficient knowledge and exhibit negligence toward the importance of routinely maintenance of VLC units. Within the limitation of this study, dentists among private clinics express poor knowledge, maintenance, and attitude toward VLC units. Although half of the tested sample was around adequate intensity, educational programs are advisable, and routinely monitoring of VLC units is recommended. Hegde V, Jadhav S, Aher GB. A clinical survey of the output intensity of 200 light curing units in dental offices across Maharashtra. J Conserv Dent 2009;12:105-8. Jadhav S, Hegde V, Aher G, Fajandar N. Influence of light curing units on failure of direct composite restorations. J Conserv Dent 2011;14:225-7. Maghaireh GA, Alzraikat H, Taha NA. Assessing the irradiance delivered from light-curing units in private dental offices in Jordan. J Am Dent Assoc 2013;144:922-7. Martin FE. A survey of the efficiency of visible light curing units. J Dent 1998;26:239-43. Matošević D, Pandurić V, Janković B, Knežević A, Klarić E, Tarle Z. Light intensity of curing units in dental offices in Zagreb, Croatia. Acta Stomatol Croat 2011;45:31-40. El-Mowafy O, El-Badrawy W, Lewis DW, Shokati B, Soliman O, Kermalli J, et al. Efficacy of halogen photopolymerization units in private dental offices in Toronto. J Can Dent Assoc 2005;71:587. Nishad NT, Sujeer R, Toby TH, Veronica. Curing efficacy of LED and QTH light curing units for curing nanocomposite resins – A systematic review. IOSR J Dent Med Sci 2013;11:36-44. Al Shaafi M, Maawadh A, Al Qahtani M. Evaluation of light intensity output of QTH and LED curing devices in various governmental health institutions. Oper Dent 2011;36:356-61. Swathi T, Madhusudhana K, Suneelkumar C, Lavanya A. A clinical survey of the output intensity of light curing units in dental offices across Nellore urban area. SRM J Res Dent Sci 2016;7:64. Reis AF, Vestphal M, Amaral RCD, Rodrigues JA, Roulet JF, Roscoe MG, et al. Efficiency of polymerization of bulk-fill composite resins: A systematic review. Braz Oral Res 2017;31:e59. Roberts HW, Vandewalle KS, Berzins DW, Charlton DG. Accuracy of LED and halogen radiometers using different light sources. J Esthet Restor Dent 2006;18:214-22. Santos GC Jr., Santos MJ, El-Mowafy O, El-Badrawy W. Intensity of quartz-tungsten-halogen light polymerization units used in dental offices in Brazil. Int J Prosthodont 2005;18:434-5. Tüloğlu N, Özer S, Şen Tunç E, Canbaz S, Bayrak Ş. Knowledge and attitude of dental clinicians regarding light-curing units in Northern Turkey. Clin Dent Res 2016;40:26-34.